Novotel Ambassador Seoul Dongdaemun Hotel & Residences presents new packages for the holiday season. The Dear My Santa! 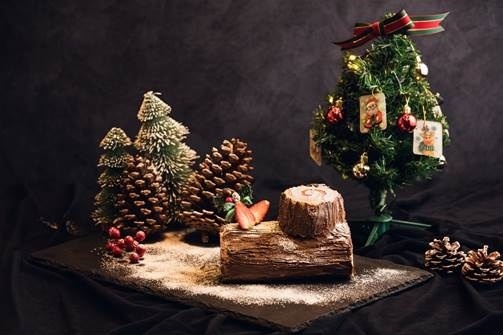 package includes a night’s stay at the hotel, a Bouche de Noel Christmas cake and a do-it-yourself Christmas tree set. It will be offered from Dec. 21 to 25, with prices ranging from 249,000 won to 299,000 won. The All About Christmas! package adds extra perks, such as breakfast for two, in-room dining service and late checkout. It will be offered from Dec. 21 to 24 at 599,000 won. For more information, call Novotel Ambassador Dongdaemun at (02) 3425-8000. JW Marriott Seoul presents the Ultimate Romance package for couples and friends seeking a staycation over the year-end holidays. 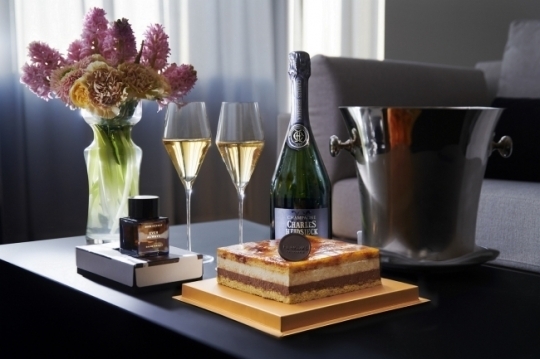 The package includes a night’s stay, a coffee-flavored cake from the hotel’s patisserie and a bottle of Charles Heidsieck Brut Reserve N/V. Two guests will be allowed access to the swimming pool, fitness facility and Executive Lounge, which offers dining service six times a day. The package price for the Executive Suite starts at 640,000 won and Executive Deluxe at 470,000 won. For more information, call (02) 6282-6282. Now in its 16th year, the Christmas Tree of Hope is made with 200 Winterberry flower pots, and each vase bears the logo of a sponsor, or a Love Card that the sponsor wants. The tree will be displayed until Jan. 6, along with other Christmas decorations. Winterberry pots are priced at 100,000 won for a small one, and 1 million won for a large one. Donation receipts can be issued. For applications or inquiries about the Christmas Tree of Hope event, call the hotel at 02) 559-7422. 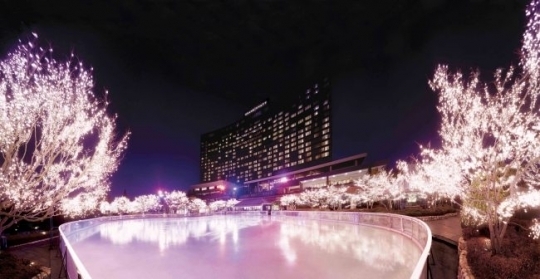 Grand Hyatt Seoul has turned its outdoor swimming pool into an ice rink for the winter season. Now in its 22nd year, the rink accommodates up to 150 skaters across its 1,100-square-meter surface. An array of hot delights, including hot chocolate and soups, will be available at the rink-side snack bar. The ice rink will open Tuesday and operate throughout February. Hours of operation are from noon to 9 p.m. on weekdays and 10 a.m. to 9 p.m. on weekends and holidays. The entrance fee (2-hour use) costs from 27,000 to 33,000 won. For more information, call Grand Hyatt Seoul at (02) 799-8112. 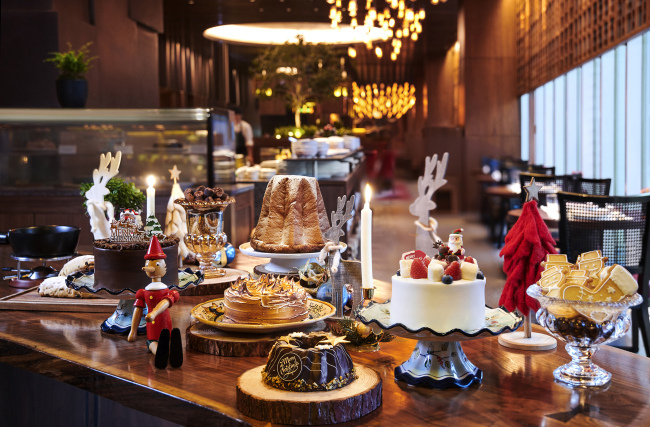 Park Hyatt Seoul’s Italian restaurant Cornerstone presents the festive brunch Buone Feste. For the festive season, the buffet station will be filled with Italian winter seasonal dishes, seasonal seafood and Christmas desserts. Lobster gratin, grilled lamb chop and tenderloin steak are served as main dishes. Diners can also enjoy various drinks and unlimited wine. 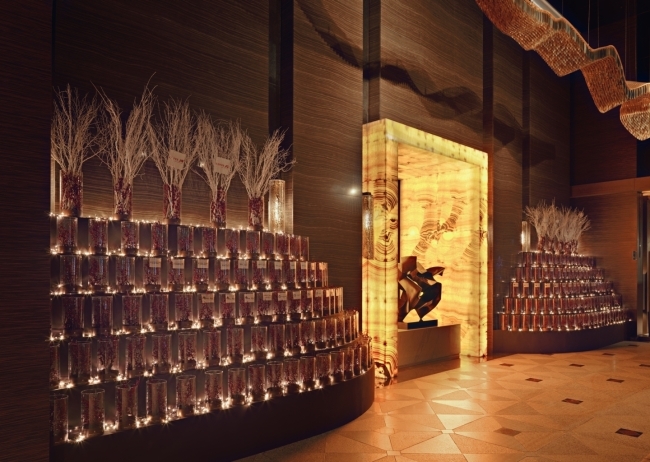 The brunch, priced at 128,000 won per person, is offered on weekends and holidays during the holiday season, including Christmas and the end of the year. For more information or reservations, call Cornerstone at (02) 2016-1220.